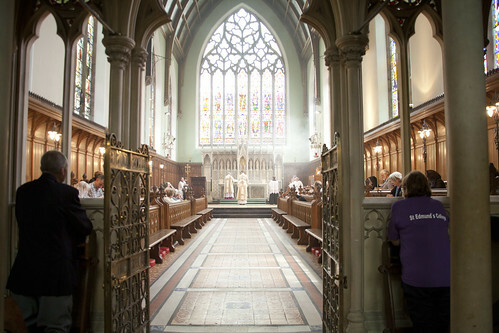 We are very blessed to be able to hold events in some of the most beautiful and interesting historic Catholic churches in England and Wales. St Edmund's College, Ware, is a spectacular example. The view from the Rood Loft. The chapel, by A.W. 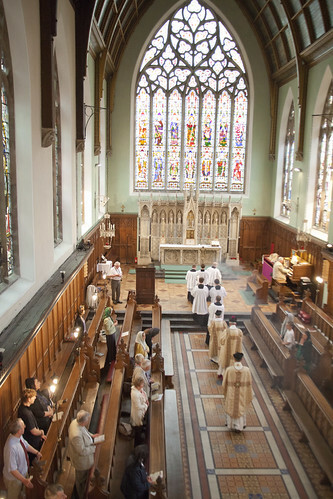 Pugin, was built for an institution which included both a Seminary and a School. (The Seminary later moved to Allen Hall.) 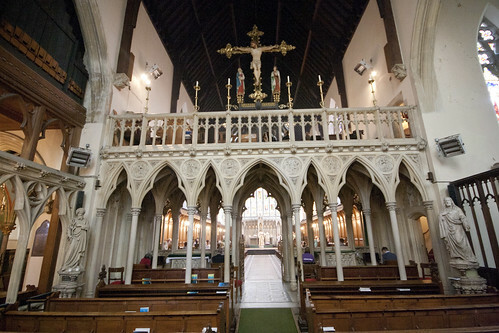 The characteristic Pugin Rood Screen is in place, but there is a substantial choir for the clergy and seminarians, and the planned nave was only partially built, and added to later with the 'Galilee chapel'. The overall impression is that the Rood Screen, with its substantial Rood Loft where the choir can use, does not so much screen off the sanctuary, but forms the East wall of the chapel. 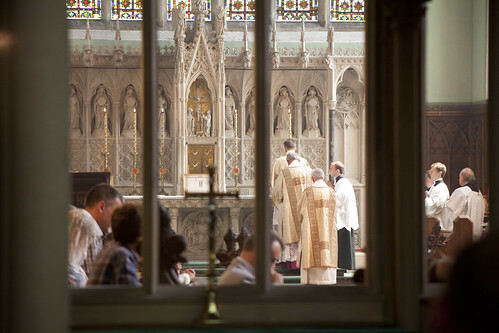 However, it is still possible to view the ceremonies through the screen, as Pugin had intended the Faithful to do. 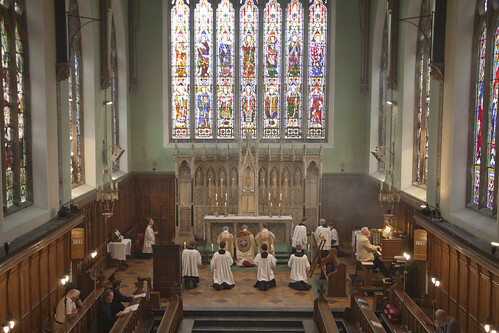 The importance for the Catholic Church in England of Pugin's work in the Gothic style is hinted at in many of the stained glass windows, depicting something you tend not to see in Anglican churches or, for that matter, in modern Catholic art: that is, previous generations of Englishmen engaged in Catholic worship. Pugin was demonstrating artistically the continuity of the Catholic Church in England. What our ancestors did, we still do. We aren't embarrassed by the relics of the past we find, by people in Shakespeare exclaiming 'by the Mass! ', by Medieval wall paintings coyly whitewashed over. 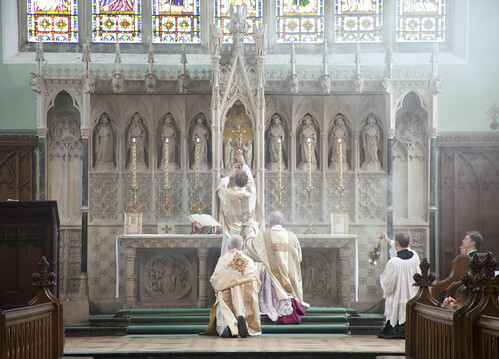 No: there is an organic continuity between the belief and practice of the ancient and medieval Church in these Islands with the Catholic Church here today, and not with the 'Ecclesia Anglicana' which has usurped so many of its titles and taken possession of so many of its buildings. This extends beyond the Mass, to other devitions. A small chapel where the relic of St Edmund of Abingdon is kept is decorated with windows and a ceiling painting depicting the history and veneration of the relic - naturally enough. We venerated it yesterday. Catholics who feel uncomfortable about venerating relics need to ask themselves what the sensus fidelium was up to during the long centuries in which this practice was a major part of the Catholic spiritual life. 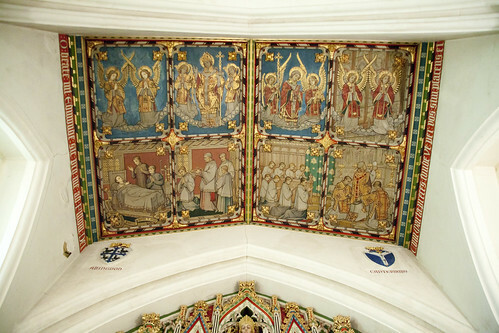 The relic of St Edmund is carried to a man ill in bed - lower left panels. It is, of course, the same relic in the same reliquary, in the pictures and in use today. St Edmund's relics were preserved thanks to the fact that he died in exile, so his relics were beyond the reach of the agents of King Henry VIII, a man who did not want to be reminded of Archbishops of Canterbury who stood up for the rights of the Church against the Crown. The Day of Recollection was well attended, and led by Fr Armand de Malleray FSSP. 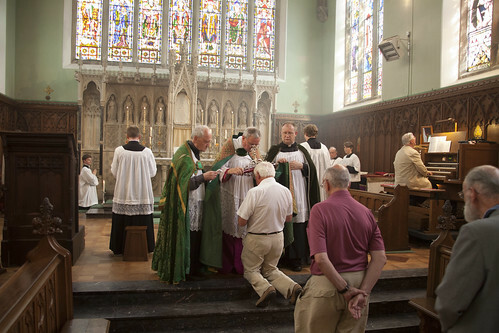 We had a good number of priests, making possible confessions throughout the day and High Mass and Solemn Vespers. 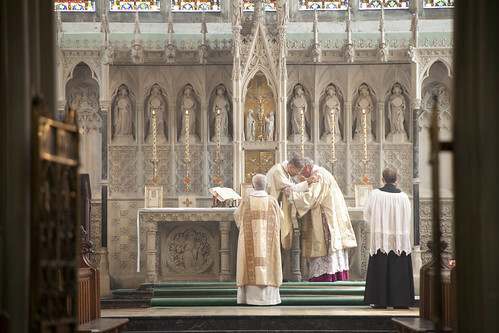 Fr de Malleray was joined by Mgr Gordon Read, the LMS National Chaplain, who was deacon and preached at Mass, and officiated at Benediction, Fr Patrick Hayward, who was subdeacon at Mass, and Fr Matthew Goddard FSSP. We also had three seminarians of the Fraternity helping, and those who know them will spot them in the photos.